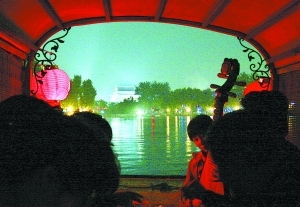 Special Experience: not only feel the essence culture of hutong, but have a funny boating cruise on the Shichahai Lake. Be met our private English-speaking tour guide at the check point at Shichahai area. Have a rickshaw trip along the beautiful Shichahai lakeshore, where locates many characteristic bars. Drop off at Yinding Bridge, one of the minor eight sceneries of old Beijing. Walk along Yandai Xijie Street, a Chinese traditional shopping street that remains the bustle as before. Pass through the narrow Hutong alleys, to seek for the history of old Beijing city. The highlight of the tour is a cruise on Shichahai Lake. Seated on the big scull boat, listen to the beautiful music played by Chinese instruments, and float the colorful River Lanterns.